I like to see the best in the little things in life. Stay tuned for some fun. What is the first thing you think of when you think "Duck"? Is it Donald or Daffy Duck, or the "Rubber Duckie" song from Sesame Street, or perhaps visiting a duck pond and feeding them bread? Ducks have been ingrained into our childhood memories yet not many people would consider having a duck as a pet. 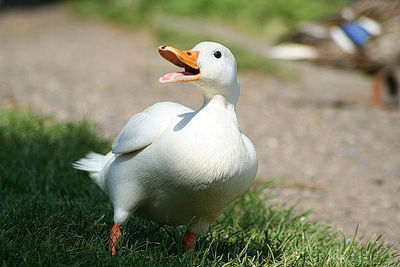 However, ducks are incredibly loyal, friendly and amusing animals to own. Ducks are very social animals and unless you are able to dedicate all your daylight hours to entertaining your new friend, it is recommended to have two or more. If you raise ducklings they are likely to "imprint" on you and they will come to identify you as their mummy and themselves as humans. They will follow you around and rely on you to teach them what they need to know. 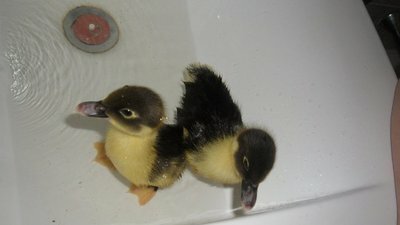 Ducks and ducklings are available for around $15-$20 each at pet shops or from breeders. You should never take a duck from the wild as they are not bred to be pets. While ducks are hardy animals and are very easy to care for, there are a few things you need to know to keep your pets happy and healthy. Ducks may be waterproof, but they do need some protection from the elements or they are prone to heat stroke or pneumonia. A small shed, large enclosed aviary or dog house are great pre-made options for shelter, or you can build your own. It is important that there is adequate drainage away from the shelter such as a sloped roof or slatted floor, so moisture doesn't gather where your feathered friends will sleep. A flat floor is also important, and any wire or mesh on the ground should be covered with thick, heavy material or wood to prevent a disease called bumblefoot. 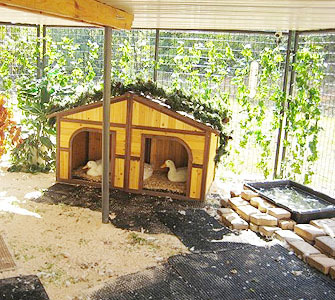 Your ducks need to feel safe in their house, so enclosing an area as a run that is cat and dog proof is a good idea. If you want your ducks to roam free through your yard, it is best to put them to bed in a shed at night to keep them safe from neighbourhood predators. Ducks will eat almost anything they can get their beaks on. A healthy diet for a duck should be balanced and rich in nutrients and protein, much like a human diet. You now have a disposal system for all your dinner scraps. Ducks will graze throughout the day so if you have grass that they can roam on, you may find you won't have to mow anymore. Laying ducks need a diet higher in protein than drakes, so feeding the little lady mashed boiled eggs with the shells crushed up (their own eggs are fine, too), baked beans or meat scraps will keep her laying more frequently and her eggs will be better quality. Layer pellets or most wild bird mixes will stop her going hungry. Ducklings also need high protein but are unable to digest meat or anything large, so cans of dog or cat food are a good option, or if you have a livestock or poultry supplier nearby, chicken starter or crumbles is a cheaper alternative. On cold days you may want to tempt your babies with some thick porridge made with water. Drakes or non-laying ducks will eat table scraps and grass clippings, and for a well rounded diet add some scratch mix available from livestock suppliers and some pet stores, or wild bird mix which is available in most large supermarkets. As mentioned previously, ducks will eat anything, but there are a few things you should keep them away from. Anything that is bad for humans is probably bad for ducks such as cake, chips and alcohol. Bread is a major culprit for reducing the life expectancy of ducks as it can swell up inside them and they may choke. Ducks also have trouble digesting processed foods and dairy so cheese and chocolate should especially be avoided. If you want to treat your ducks a few good options are cherry tomatoes or chopped up tomato wedges, cracked corn, or the occasional piece of cake or a handful of chips if treated sparingly. Any kind of sweet fruit can be used as a treat as well if chopped up into beak sized pieces. It may seem obvious but water is incredibly important for ducks to survive. It is not necessary to have a pond for your ducks, but they do need a constant source of clean water to aid them in digestion. A bird waterer or feeder are options, or a cement bowl that the ducks cannot tip over, or even a bucket assuming the ducks are big enough to reach into it. Ducks need enough water to be able to cover their entire beak without touching the bottom, so they can clean our their nasal cavity which can become clogged with food otherwise. If you choose to have a pond, ducks can be a great joy to watch in the water. If all you have space for is a plastic tub or a child's plastic sandpit, your duck will be happy regardless. If you have the space and the time to set up a proper duck pond, you need to ensure it is sustainable. Ducks are very messy and a standard pond pump is not suitable for keeping a duck pond clean. Duckweed and other fast spreading pond plants can help keep the water clean by breaking up the nutrients left in the water and making them easier for the pump to filter, but be warned that ducks will try to eat them. Fish would also do a great job at keeping the pond clean, but they're not likely to survive their first day in the water with curious and perpetually hungry ducks in the vicinity. You will probably find yourself emptying and refilling your pond at least once a month. Ducks are susceptible to some water borne diseases so keeping their water clean is imperative. Australia breeds 3 main domestic duck breeds. The most common of these is the Pekin. Pekins are all white with orange beaks and legs and have an upright stance. They are classified as a medium duck and an adult drake can weigh up to 5kg. Their lifespan is 9-12 years in captivity. Pekins are one of the more intelligent of their species and will prefer the company of humans to other ducks. They are incredibly friendly and loyal as are most ducks and are happy to live indoors or outdoors. Pekins are not proficient swimmers and prefer to forage and wander around, but won't pass up a good swim if given the opportunity. Pekins are also excellent guard "dogs" and will alert the family if there is any danger. Khaki Campbells are also bred in Australia as a domestic duck, but are also farmed as laying ducks. Campbells are a small compact duck that can be timid until they get to know you. An adult drake can weigh up to 2kg and will live about 8 years. Campbells are excellent laying ducks, laying in excess of 300 eggs per year, but their breed does not have a good reputation for being broody, so if you are interested in breeding Campbells it is best to invest in an incubator. Campbell drakes have a striking colour scheme of pale mottled brown and grey over most of his body, a bright blue patch under his wings and a velvety green head and neck. 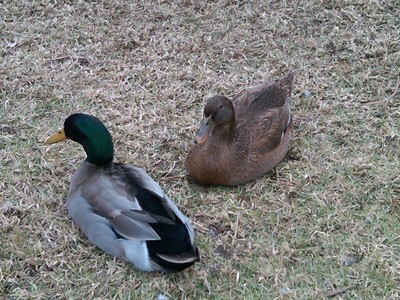 The female duck is a mottled "khaki" brown and black. Both the drake and duck have rich brown eyes and their beaks and legs can range from grey to orange with black beak tips. Campbells are excellent swimmers and will happily spend all day dabbling in a puddle or chasing worms in the mud. The third breed of duck most commonly found as a pet in Australia is the Muscovy. This duck is large and not particularly attractive, weighing up to 8kg with an average wingspan of 2m they can be a little intimidating to look at. This coupled with their trademark red, blotchy naked faces means they are not one of the more popular breeds to keep, however they are fiercely loyal and gentle ducks that most closely resemble a pet dog. It is not uncommon for a Muscovy to meet it's owners at the fence with wagging tails and heads bobbing for a pat and a cuddle. These ducks do not have quacks, but rather have more of a quiet raspy hiss which is good for people with close neighbours. Muscovies are perching ducks and are comfortable being held, but this also means they are prone to short, low flights across the yard which your cat mat not appreciate. Due to the sheer weight of these ducks, there is little chance of them flying high enough to get out of your yard, so there is no need to clip their wings. 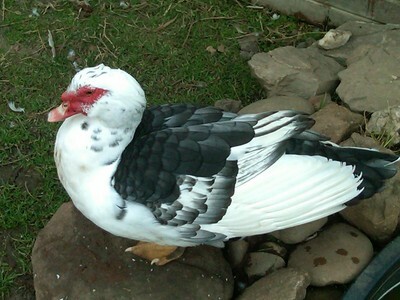 A grey/blue Muscovy drake. Muscovies also come in black/green and fawn. Ducks poo. A lot. It is important for the health and safety of you and your family that you have a way of containing their mess as it can be a sanitation issue and can also become very slippery on hard surfaces in the rain. As ducks do not have sphincter muscles it is not possible to litter train them, so the best option is to contain them in a part of the yard that unsupervised children can't access. If you choose to have your ducks inside there is a simple solution that has become very popular in the US- duck nappies. If you are handy with a pair of scissors and a sewing machine you can try making your own using the pattern on this site. Duck nappies mean you and your feathery friends can snuggle together inside on a winter night and watch NCIS without having to worry about poo. Ducks may not be the smartest animals on the planet, but they will love you unconditionally. Enjoy their company as much as they love yours and treat them with respect and you will have a great pet for many years to come. Why? Ducks are incredibly loyal, friendly and amusing animals to own. Hi guys, I really want a pet duckling so do you know the zones for places you can have a duckling? Because ducks are not a common pet they come under the livestock category in your councils restrictions. Most councils will allow fowl if they are contained properly, faecal matter is removed often and disposed of safely (or watered into your grass as it is excellent fertiliser) and they do not make too much noise. Contact your local council if you are unsure. Remember, too, that ducklings do grow into ducks and that cute yellow fluffy thing will be almost fully grown in the next 8 weeks. Like any pet it is a big responsibility, but unlike dogs and cats ducks will usually be euthanased if picked up by the pound. Some pounds -blacktown I know is one- will hold ducks for short times so perhaps even consider adopting an older duck that is less work than a duckling and you know exactly what you are getting. Good luck and enjoy your duck! My duck is very small and is 5 yrs old, she is 5cm small. Can you help?? What a lovely article. Hopefully will go some way towards preventing the dumping of domestic ducks in suburban parks. Cross-breeding between Mallards and Pacific Black Ducks (native) has been a big problem in some areas. Your Khaki-Campbells look a lot like Mallards, except for the neck ring. Well done.